what have you been working on? 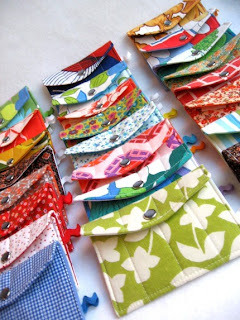 for me, sewing-wise, i’ve been working on lots and lots of eco wallet orders of late. especially fun, i’ve had a fun flurry of fun brides ordering vintage eco wallets for their wedding attendants! isn’t that a fun idea? i love it. some folks are ordering a whole set of the same fabric, others are ordering individual fabrics chosen especially for each bridesmaid! so fun! so, in honour, i’m now offering rikrak eco wallets in little bundles, at a special rate, for a limited time. 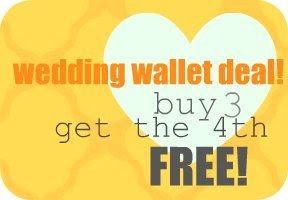 now when you buy 3 wallets, you get the 4th FREE. woohoo! and yay to all of those eco-forward weddings out there! (ps: by the way, no need to be getting married to take advantage of this fun offer… all eco lovin’ wallet needers can save!).. you can find more details in my shop listings, or feel free to contact me! in other rikrak news, just a little reminder.. i’ll be drawing the winner of my rikrak gift certificate tonight @ 9pm … and there’s also still time to enter the mchen silkscreened tshirt giveaway! woohoo! wishing you well with your projects! and have a superdooper weekend. Your wallets are so pretty, RikRak! I might have to get remarried just so I can give them to my bridesmaids. Great idea. Have a great weekend. Are you going to the Race festivities? 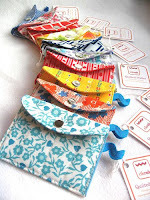 rikrak, your wallets are great and the fabrics are so bright and cheerful! Your fabrics are always so gorgeous, RR! I just love seeing what you've come up with! I tried on a skirt today and thought of you....it was pink and white and had rikrak on it! it's a golf skirt and i don't golf, but it's still really cute. 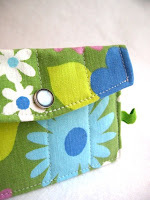 love your wallets and fabric choices. so simple, so useful, so creative.